Most people can only guess where they stand in terms of their financial health most of the time. We are not talking about people who ‘don’t care’ here; we are talking about perfectly reasonable and interested people. People who when feeling poorly take their body temperature, measure their pulse, have blood pressure monitors and use them, and hop on the scales far too often. Even if you don’t go to that extreme when feeling off, odds are you take better care of your health than your finances. What I am asking is if we are smart enough to take all these measurements when it is about our physical health why do we fail to monitor our financial health? In this post, I’ll address all of these issues. If we take these initial steps on the journey to financial health, we will see a dramatic and positive change in our finances and our lives overall. Working out one’s income should not be a problem. However, there is the matter of individual income, family income and company income; the difference between pre-tax income and after tax income; and the importance of yearly, monthly, daily and hourly income. So, to keep things simple, we can say that income is all money that, figuratively speaking, goes in you or your family’s pocket. This includes your paycheck, any interest and dividends you earn as well as any money you earn on the side. You don’t need to go crazy tracking this number since most of it will be on your tax return. The only missing number might be some cash you earned on the side, but for the most part, what is on your tax return is good enough. In order to track your income, simply create a spreadsheet and in one column list the year and in the next, list your income. The following year, do the same only in the row below it. variable expenditure which cannot be cancelled or negotiated but can be controlled (expenditure on food, for instance). Working out your spending can be time consuming but is relatively straight forward. All you need is your bank statements for the last three months. Working out your variable expenditure can be a bit more tricky and you may need to record all you spend for couple of months; it is a bother but so much worth it. The goal here is to start reducing your spending. The reason you want to do this is two-fold. First, the less you spend, the more you save and invest. As you save and invest more, your money compounds faster leading to greater wealth. And second, if you can learn to live on less, you can quit your job and retire that much faster. All of those headlines telling you that you need $1 million or more for retirement don’t take the approach of reducing your spending. So how can you reduce your spending? There are two main approaches. You need to figure out which one works best for you. The Home Run: In this approach, you attach big expenses first. Look into refinancing your mortgage. Appeal your real estate taxes. Shop auto insurance coverage. These will tend to save you the most money and for those that will be motivated by these savings to then attack smaller expenses should take this approach. The Slow And Steady: This is the opposite of the strategy above. Here you look at smaller expenses first, like your groceries or even your cell phone. Once you build up some momentum in saving some money through these efforts, you can then move on to the bigger expenses. I find the definitions of assets and liabilities offered by Robert Kiyosaki in his book Rich Dad Poor Dad to be straight forward and useful ones. These build upon a very clear and easy to work with criteria – whether money gets in or out of your pocket. So, assets are ‘everything that puts money in your pocket’ and liabilities are ‘everything that takes money out of your pocket’. Pretty clear, isn’t it? Clear as the distinction between assets and liabilities may seem there is always space for confusion. A common confusion is the one between assets and possessions. Possessions are all the things one has, like savings, cars, jewelry, furniture, house(s) and land. There is nothing wrong with possessions – in fact they often give us our sense of security. However, possessions do not usually generate value or more wealth; possessions do not necessarily work for one’s financial health either. More interestingly, possessions are neither assets nor liabilities but could become either. The reason you track these numbers (which we get into next) is to make sure you are spending your money wisely. Looking only at income and spending doesn’t paint the full picture of your financial health. Knowing what your assets and liabilities are will help complete the picture. One’s net wealth is probably the most useful number in terms of long term financial management and planning. It is also the most difficult one to face; a bit like standing on the weighing scales with a racing heart, looking down to see the number where the little arrow has stopped. Please remember that the number doesn’t matter; how we feel about it doesn’t matter; what matters is that it allows us to plan and act – our financial future or our weight loss. Even easier you can use the following net wealth calculator and it comes with a very brief guide. Alternatively, you can use any net wealth calculator you can get your hands on – just go on and do it! The reason we track our net worth is to make sure our financial health is improving each and every year. You can calculate your net worth annually when you update your spreadsheet with your annual income. By having your net worth increase, you guarantee you are living below your means and are on track to financial freedom one day. Most people emphasize that ‘getting there’ involves knowing where you want to go. Whilst this is true it is equally important to know where you are. There are five numbers you need to work out if you want to know where you are in terms of financial health: income and spending; assets and liabilities; and net wealth. One addition as well as a caution for self-employed folks in the US – money from self-employment most likely has NOT been taxed. And depending on your tax bracket, the nasty surprise can be HUGE come tax time. To make the math easy, assume that you’ll pay 15% in self-employment taxes. To that percentage, add your applicable income tax bracket percentage. For instance, if you’re in the 15% tax bracket and you add another 15% for self-employment tax (30% total), you can count on nearly one-third of any self-employment income going to pay your federal taxes come April. So plan your spending and saving throughout the year to avoid coming up short when it’s time to file your tax return. Thanks Crystal. Yes, money from self-emplyment and side-hustle is not going to be taxed. People have to make sure that enough is put aside for tax (and other contributions but this vary between countries). Nice post. 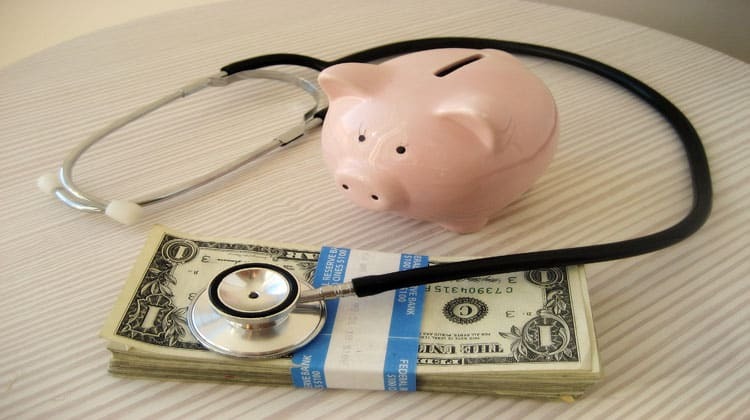 Sadly I know too many people that not only don’t take care of their financial health, but they also neglect their personal health and never see a doctor. Still, when they don’t feel well soneone takes there temperature, or pulse. They step on the scales (we are not talking taking action here, not yet…). There are people who have not seen there financial statement for years! Completely agree Maria! Most people will look at their assets and completely discount their expenses. Strange isn’t it? I think that great confusion rules in this area and that it is out duty to support people deal with it.